Yogesh currently lives in Minneapolis and works as a Senior Software Engineer. He has a masters degree in Computer Science from University of Minnesota, Twin Cities. At graduate school, he did research in programming languages because of his love for functional and object oriented programming. Currently he delves into more details of Java, web development and security. Previously he worked as a product manager to create web application for health insurance brokers. In his free time, he listens to music and writes fictional stories. 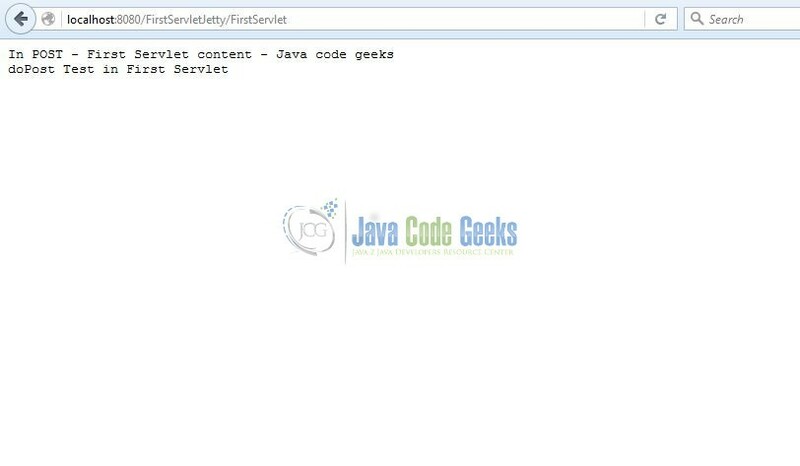 In this example, we will show you how to make use of Jetty – Java HTTP Web Server and servlet container and run a sample servlet on this server. Jetty is an open source web server developed by Eclipse Foundation. 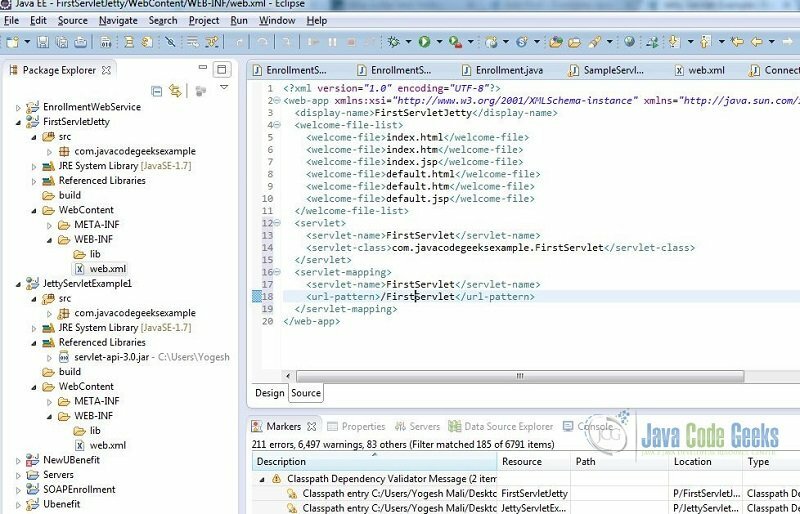 As a part of this example we will create an eclipse project which will have our servlet code and to deploy on jetty, we will configure that project in a war file. 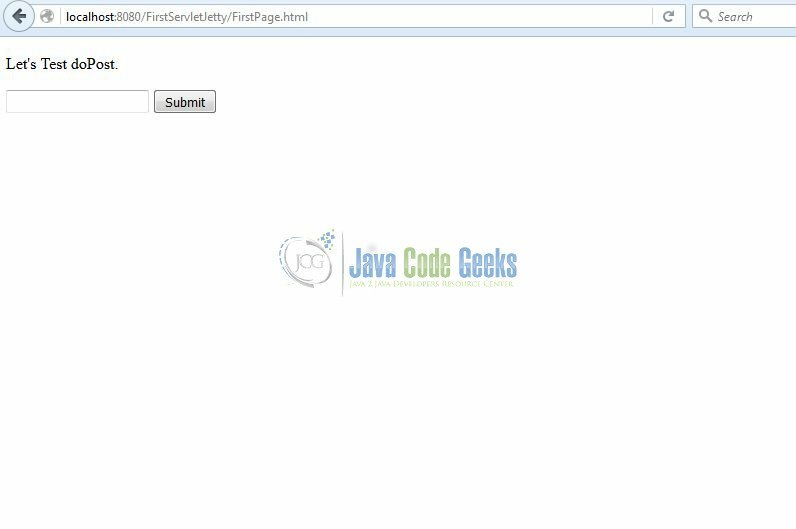 In this example, we are going to write a simple servlet and run that servlet on Jetty web server. We will package our servlet project in a WAR file. We can then deploy this war file on running jetty server and it will dynamically detect our servlet. Make sure you download the correct version of Jetty from Download Jetty. 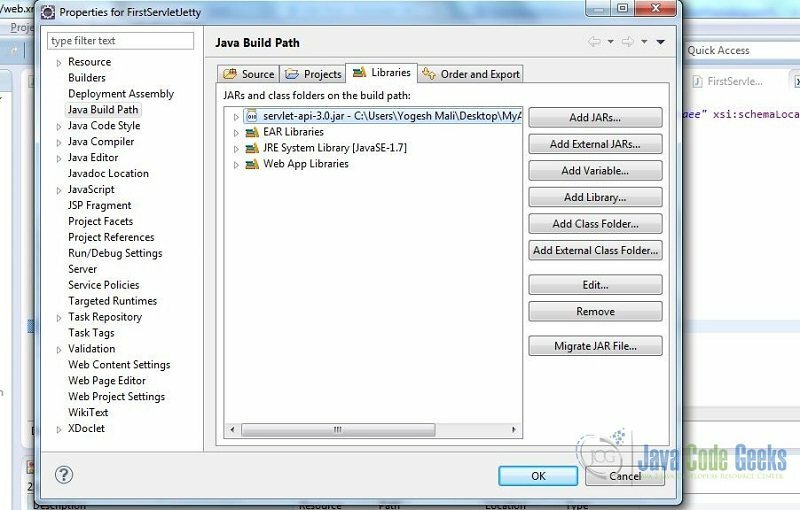 Certain versions of jetty only run with certain versions of Java. You might run into an error java: unsupported major:minor version 52.0 . 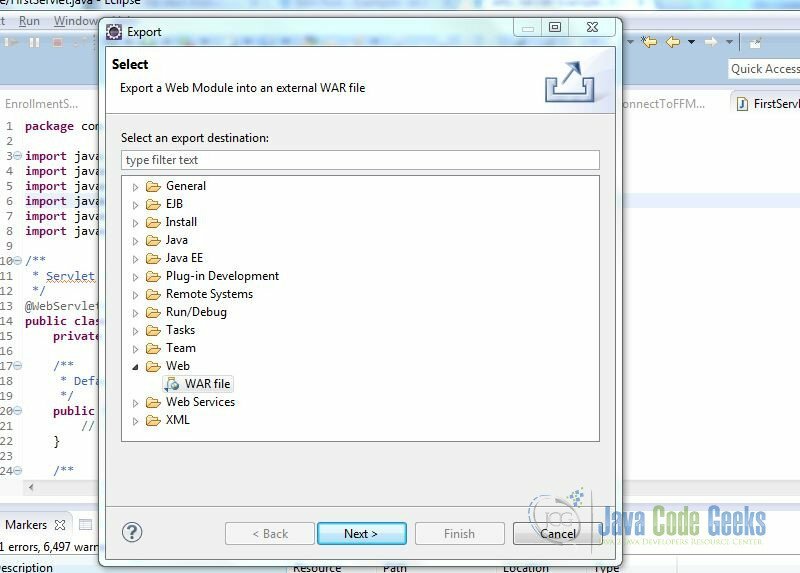 Once you extract downloaded jetty zip file on your machine, you can open a command prompt and navigate to directory /demo-base and run java -jar ../start.jar , this will start our jetty web server. To verify everything is alright with our jetty installation, launch a web browser and go to url http://localhost:8080, it should show a Jetty welcome page. After creating our project, we will need to sort out dependencies to write our first servlet. 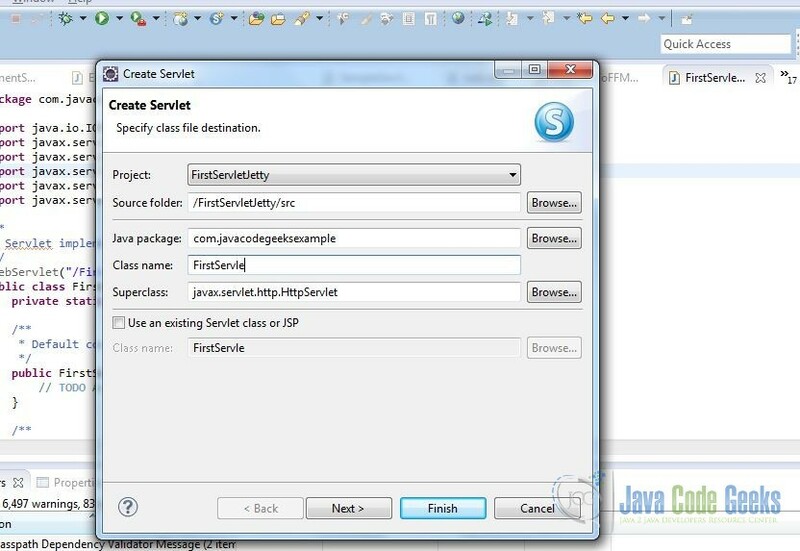 Download servlet-api-3.0.jar file and import that in our project’s build path. Now we can write our code in the servlet we just created. We can write our code in doGet or doPost . We will write very simple print statement to see how our servlet behave once deployed on webserver. Save your source code file and build the project in eclipse. Text on this webpage is coming from whatever we printed in doGet method. This was a very simple servlet to run on jetty. We can do more complicated jsp or html pages to call servlets to handle requests. Let’s add a simple form on an html page and do get action and post action subsequently. Now if you see this html page has a form with method POST which will get called through action FirstServlet . Once the form is submitted, FirstServlet will call doPost to handle the request posted through form submission. We can modify doPost method to read parameters posted through form. 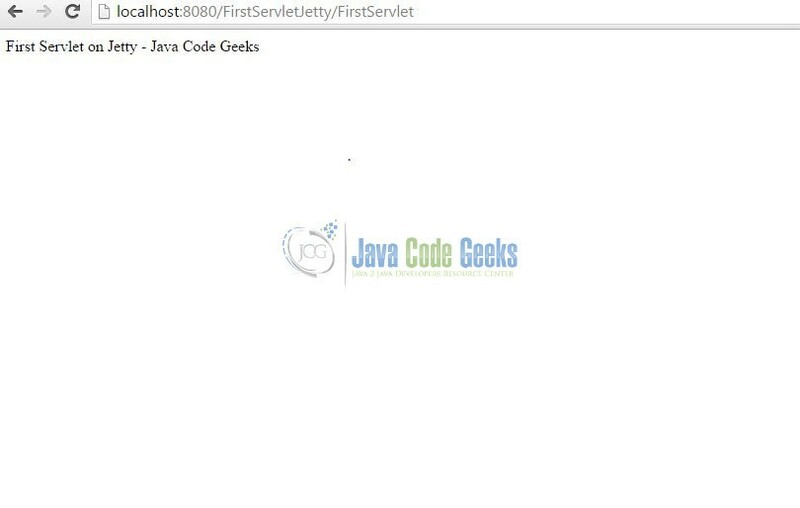 In this example, we saw how to deploy a simple servlet on a jetty web server. 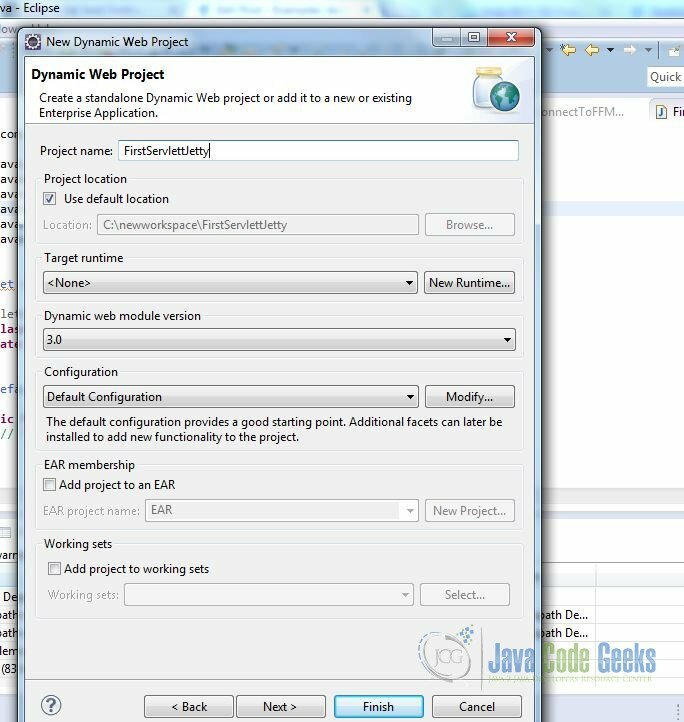 Another way of mapping your servlet is by adding a servlet-mapping in web.xml of your Dyanmic Web Project, but in that case you will need to remove the annotations @WebServlet in your java source code. This was an example of Servlet on Jetty. 166,039 insiders are already enjoying weekly updates and complimentary whitepapers!